Film and Television: One Eye Red (ett öga Rött), The Swimsuit Issue (Allt Flyter) Wallander, The Case (Fallet), Julkalendern including Superhjältejul . Arne Dahl Evil Blood, Real Humans (Äkta Människor) and Johan Falk 2. Superhjältejul was the 2009 SVT Christmas calendar in Sveriges Television, directed by Carl Englén, and the manuscript is written by Jan Vierth, Anders Sparring and Pasqual Vallin Johansson. This TV-series followed the TV-series Supersnällasilversara och Stålhenrik and was recorded during the Spring 2009. Since 2010 it is able to buy it on DVD. Lars Norén is a Swedish playwright, novelist and poet. His plays are realistic and often revolve around family and personal relations, either among those who are impoverished and rooted at the bottom of society, or those who live in material comfort but emotional insecurity. Shima Niavarani is an Iranian-Swedish actress and singer. She has performed in theater, film, television and radio in over 40 productions. Niavarani got her breakthrough at the age of nineteen in the play Autodidakt i enmansakt which she directed and played in. She toured with the play for over a year and her work received several awards. She is perhaps most known for her solo-musical Shima Niavarani är en Übermensch which was broadcast on SVT in 2010, and for her role as "Maiken" in the TV4 series Allt faller which was directed by Henrik Schyffert. Michael Niavarani is an Austrian-Persian stand-up comedian in the tradition of Austrian cabaret, an author and a TV and movie actor. Niavarani, whose comedic work often draws on his inter-cultural upbringing, is a central figure of the Austrian cabaret scene. Since 1992, he has been director of the Kabarett Simpl, a famous Viennese cabaret that opened its doors in 1912. In 2010, Niavarani won the Austrian Kabarett Award. He is also a three times winner of the Romy award. Ernst Ingmar Bergman was a Swedish director, writer, and producer who worked in film, television, theatre and radio. 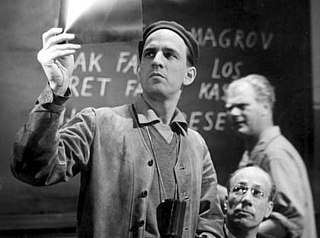 Considered to be among the most accomplished and influential filmmakers of all time, Bergman's renowned works include Smiles of a Summer Night (1955), The Seventh Seal (1957), Wild Strawberries (1957), Through a Glass Darkly (1961), The Silence (1963), Persona (1966), Cries and Whispers (1972), Scenes from a Marriage (1973), and Fanny and Alexander (1982). Shelby Fredrick "Sheb" Wooley was an American actor and singer, best known for his 1958 novelty song "The Purple People Eater." He played Ben Miller, brother of Frank Miller, in the film High Noon; played Travis Cobb in The Outlaw Josey Wales; and also had a co-starring role as scout Pete Nolan in the television series Rawhide. Additionally, Wooley recorded a series of novelty songs under the name Ben Colder, notably a #6 country hit "Almost Persuaded No. 2". Lars Sven "Lasse" Hallström is a Swedish film director. He first became known for directing almost all music videos by pop group ABBA, and subsequently became a feature film director. He was nominated for an Academy Award for Best Director for My Life as a Dog (1985) and later for The Cider House Rules (1999). His other celebrated directorial works include What's Eating Gilbert Grape (1993) and Chocolat (2000). Upplands Väsby is a locality and the seat of Upplands Väsby Municipality, Stockholm County, Sweden with 37,594 inhabitants in 2010. Children's Island is a Swedish drama film which was released to cinemas in Sweden on 25 December 1980, directed by Kay Pollak, starring Thomas Fryk and Ingvar Hirdwall. It is based on the novel of the same name by P. C. Jersild. Filming took place between July and October 1979. It won Sweden's most prestigious film prize, the Guldbagge, when it was released in 1980 and was Sweden's official selection for the 54th Academy Awards. The film became controversial in Australia, being banned in 2014, over thirty years after its original release. Lars Gunnar ("Lasse") Åberg is a Swedish actor, musician, film director and artist. Between 1960 and 1964 he studied at the Konstfack department of graphic design. The Man on the Roof is a 1976 Swedish police procedural-thriller film directed by Bo Widerberg. It is based on the novel The Abominable Man by Maj Sjöwall and Per Wahlöö. The film stars Carl-Gustaf Lindstedt, Sven Wollter, Thomas Hellberg and Håkan Serner. Karl David Sebastian Dencik is a Swedish-Danish actor. He has acted in both Swedish and Danish films, and has also had major roles in English-language films including Tinker, Tailor, Soldier, Spy and The Girl with the Dragon Tattoo. Tomas Robert Olof Bolme is a Swedish actor. He is famous for being the Swedish voice of Tintin, and he is also the voice of the anime hero Cobra. He studied at Teaterhögskolan in Stockholm during the years 1966 to 1969. Bolme has performed at Fria Proteatern, Royal Dramatic Theatre, Stockholm City Theatre and Riksteatern. He has also recorded several audiobooks and one of them is Jan Guillou's Coq Rouge. Gösta Cederlund, Gustaf ("Gösta") Edvard Cederlund, was a Swedish actor and film director. 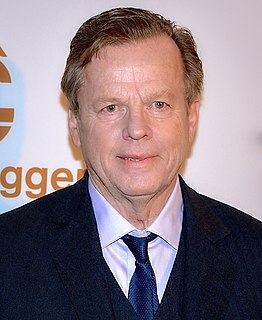 Jan Krister Allan Henriksson is a Swedish actor. He is perhaps best known for playing Kurt Wallander in the television films based on the novels by Henning Mankell. Allt flyter is a 2008 Swedish film directed by Måns Herngren. En riktig jul was the 2007 "SVT Christmas calendar", broadcast by Sveriges Television (SVT). Teddy Bear and the City of Thieves is a 2014 animated feature film featuring Bamse. A Hustler's Diary is a 2017 Swedish comedy film directed by Ivica Zubak. En del av mitt hjärta is a jukebox musical film directed by Edward af Sillén and written by Vasa based on music by one of the biggest Swedish musicians Tomas Ledin. The title is taken from Ledin's Grammis award winning song "En del av mitt hjärta". The main role goes to Malin Akerman, starring in her first Swedish project ever., with an ensemble cast featuring Christian Hillborg, Jonas Karlsson, Per Andersson, Shima Niavarani, Johan Ulveson, Johan Rheborg, and Marie Richardson. The film was produced and filmed in Sweden by Unlimited Stories. It is scheduled for release on 25 December 2019. When interviewed about the film, Ledin expressed how amazed he was by the quality of the script and how happy he was to be part of something like this. He also suggested that three or four of the songs are much better than his original. 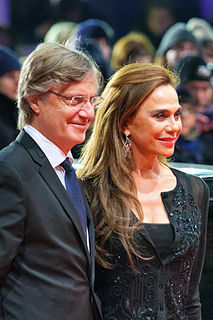 Af Sillén described the film as an "all in-musical comedy" with a great ensemble and big, lavish shownumbers. The first trailer was released on 7 December 2018.